Three days with three training sessions a day at this year's "Tour du Marteau" (aka HPP training camp in the Hamilton area). Saturday was the hilly day in the Dundas Valley including a corridor orienteering session on the new map made by Magnus J. last autumn. A route choice race and then 5 repeats of a 80m climb up a hill and orienteer down exercise to finish things off. Over 1000m of climbing. 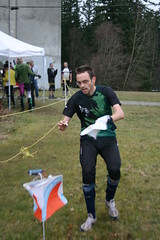 yesterday were a few middle distance races at the flat and rocky (WOC relevant according to Tero)Rocky Ridge. Wil Smith went on the last leg of the Tour with a strong lead although Robbie A. put in an impressive 36 minutes for the final 6km course of the weekend. Thanks to Patrick Saile for doing most of the work. The first ever Canada Cup Elite Series race took place back in February at the Vancouver Sprint Camp. The WRE at the South Surrey Bike Park offered intense navigation and route choice in a labyrinth network of trails. Map and courses are here on RouteGadget. GVOC jumped out to an early lead in the series thanks to dominating performances by Thomas Nipen and Louise Oram. Both were well ahead of the competition and claimed the $150 winner's cheques. Here are the current standings! The next race on the Elite Series program is Sage Stomp XVI on May 21-22. This event will bring competitors back to the site of the 2003 Canadian Championships, the Gardens Creek Ranch, a short drive west of Kamloops. The program will offer a Sprint, Middle and Long. All races count towards selection to the team that will represent Canada at the World Championships in France in August. Here you can find info and registration for Sage Stomp XVI. The Canada Cup program will then continue with the races in the Yukon during COC week-long festival. The rest of the program is still to be confirmed, but we hope to have the Elite Series Final at the Ontario Champs in Ottawa in October. Stay tuned!